What do you do at 2:30 AM when you’re stricken with a bout of insomnia? Why you tackle a prototype matting job for a very large triptych (3x 10×13 images in a 20×40 mat/frame). Which of course you mis-measure the windows in the horizontal dimension, ending up cutting them 1/4″ too wide. At least I didn’t screw it up prototyping with 8 ply mat board (which I’ve been known to do before). I think the sequence and the tonal values works for the series, which I’m titling “Head, Heart, Hand”. Or something to that effect. I think sometimes (perhaps most of the time? All of the time?) presentation can make or break an image. Its success is the culmination of many decisions that begin with the decision of what camera and film to pick up before heading out the door in the morning, following through to what to point the camera at, on to what developer, paper, process, cropping… it doesn’t end until the framed print is hung on a wall, sequenced with the rest of the prints in the show. They all build on each other. What do you all think of the sequencing of this triptych? Head, Heart, Hand, or the other way round? Any other critique/feedback is welcome. All three images were shot on Kodak Tri-X, in my 1956 Rolleiflex 2.8E. Film developed in Pyrocat HD, printed on Ilford Warmtone MG fiber paper processed using Ilford Warmtone developer. 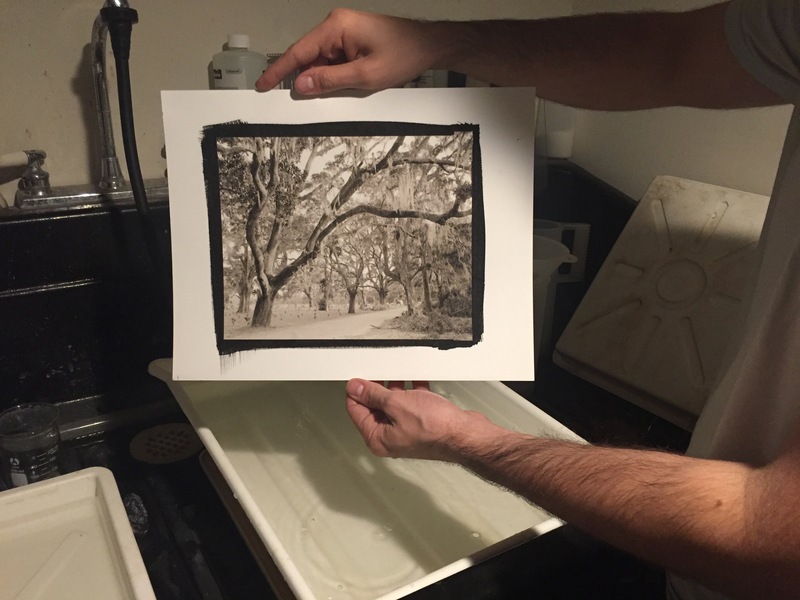 When doing enlarging of silver gelatin prints, it is often a prerequisite to a finished print that you do some burning and dodging to get the finished image exactly the way you envisioned it. And to compound the challenge, the area you want to burn or dodge is seldom neatly covered by an out-of-the-box tool like an oval, circle, or a straight line. That’s when you have to get creative and make some custom burn cards. This image I made was a perfect example. 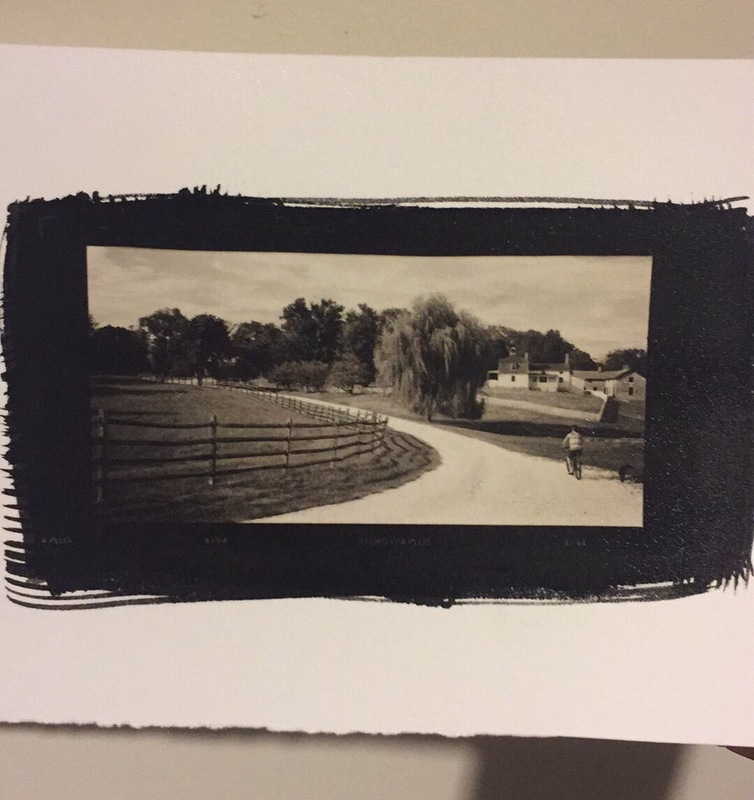 In a straight print, the sky is merely gray, and has a wisp of cloud on the right side that unless burned in looks like a bad printing mistake. To get the sky burned in, without losing details in the roof, I had to make a custom burn card. I took a stack of paper boxes, placed them on the easel, then my burn card on top. I projected the negative onto the card, traced my outline, then cut it out. When doing my burning passes, I held the card at approximately the same height as it was when I cut it. You can see it in the second photo in action. The only way to get more precise with burning and dodging is to make a contrast mask and sandwich it with the negative in the carrier during exposure. That technique presents a whole new set of challenges because you have to get the mask in absolute register with the negative, and deal with dust on four surfaces, not to mention the possibility of newton rings. Just a real quick video of an exposed print being developed. 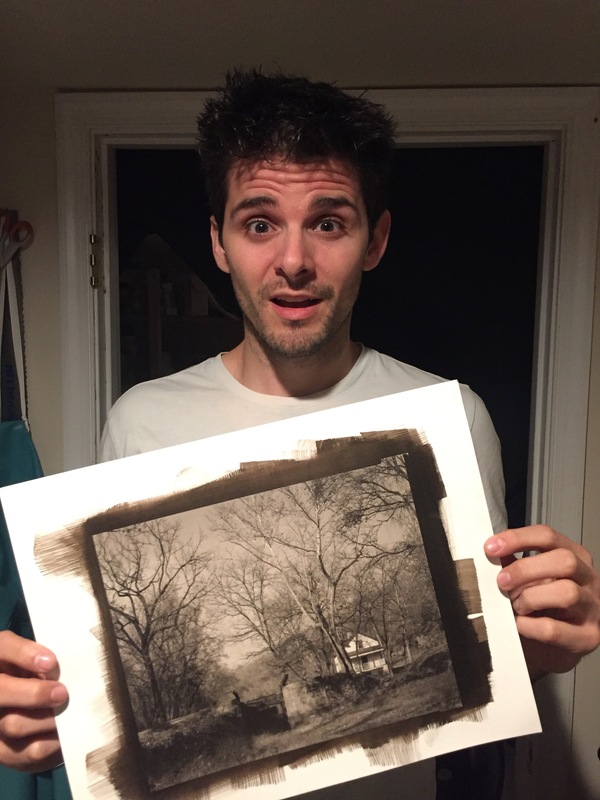 This is what a develop-out print looks like, and how quickly the developer works. The print is almost fully realized in the first twenty seconds of the development cycle, but you still need to give the full two minutes to let the highlights fully develop. 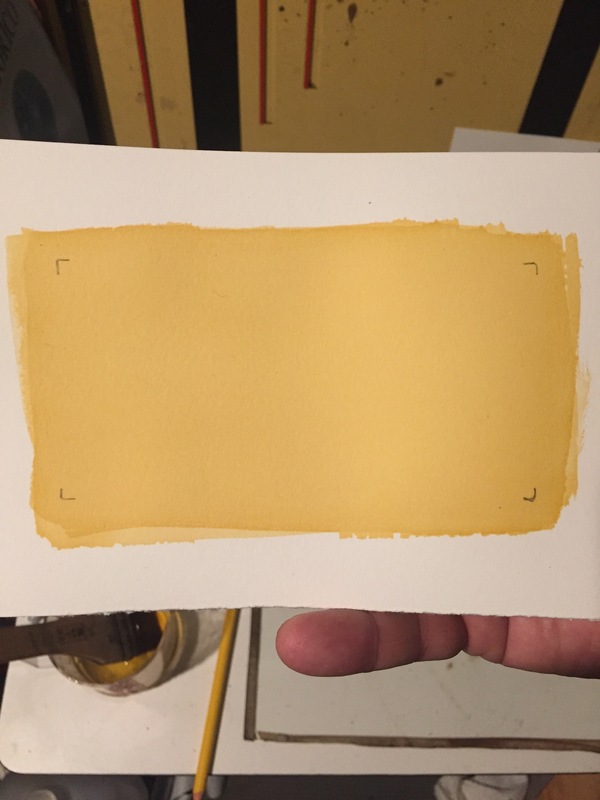 This is what the raw, unexposed double-coated emulsion looks like. I double-coat to get better shadow depth and highlight separation. You can see the two coatings on the lower left. The reason I’m willing to double-coat is that I’m making such small prints that the extra cost isn’t prohibitive. And the finished print. I think the end result justifies the added labor and expense. Just in case with all my recent postings about the Fuji X-T1 you all thought I was converting over to the binary side, here is a photo of my newest darkroom treasure. It’s a Beseler 45V-XL enlarger chassis (I already have a light source to mount on it). 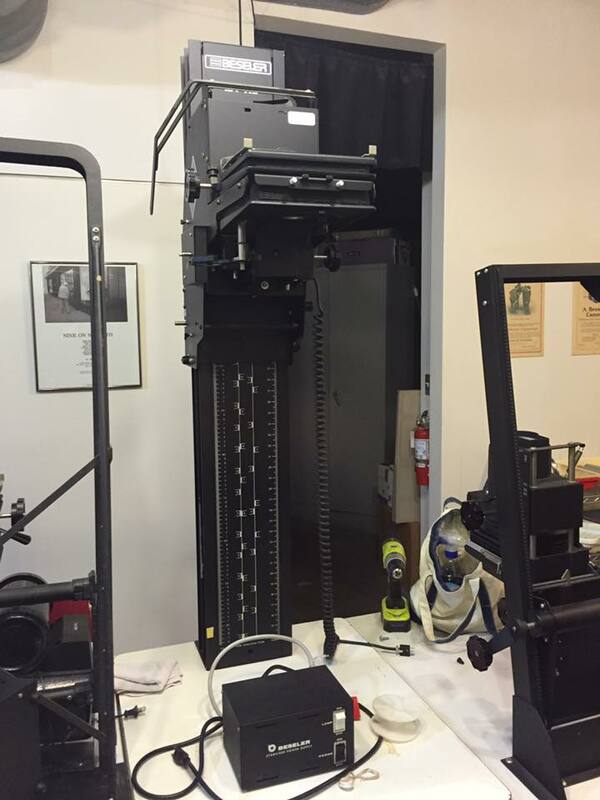 It’s really my dream enlarger. I currently have a 45 MX(? – not entirely sure of the model number. It’s the older style Beseler 45 M-series with the blue finish), which while very good, is a little cantankerous and it has a problem – when I try to print small, because of the design of the columns (they’re angled) I can’t print small on it with my easels – the head is too close to the column and I can’t move the easel far back enough to center the image. This baby solves that problem. The head sticks out far enough that it is ALWAYS centered on the baseboard. Now the challenge will be to fit it in the darkroom because the column is taller than the 45MX by a good 8-9 inches, and my ceilings are tragically low. Oh, and the best part? It was free. Photoworks was de-accessioning some enlargers and if I hadn’t taken it, it would have gone to the scrap heap. Yay recycling!